President Donald Trump addressed the United Nations General Assembly Tuesday for the first time. 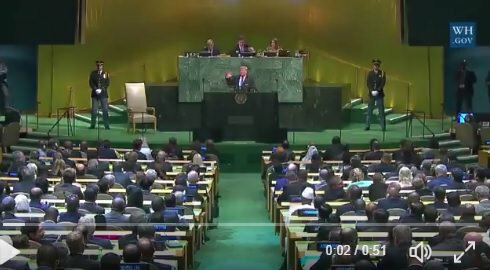 The US president delivered a fearless speech to the international body. President Trump slammed the terrorists of Hezbollah, the dangers of socialism, the murderous Iranian regime, Obama’s embarrassing Iranian nuclear deal, and North Korean ‘rocket man’ Kim Jong Un. Israeli Prime Minister called President Trump’s address the bravest and sharpest speech he’s heard in 30 years. Prime Minister Netanyahu called the bold and courageous. Trump spoke cold truths to the international body.